Did you know if you have a poor credit score, you may end up paying more for car insurance? Or, that your credit score may limit your cell phone service options? According to a recent survey featured by Los Angeles Times, nearly 50% of Americans were unaware of these negative effects from their credit score. Although many understand that a low credit score can impact their ability to rent an apartment and home, a large number of Americans did not know that a low credit score can cause other negative consequences, such as hiking up your utility bill deposit. With more than a quarter of Americans suffering from a poor credit score, what is one to do when faced with the loaning process? While it’s not a secret that a majority of traditional lenders such as banks and credit unions are likely to turn down low credit borrowers, this gap leaves many wondering where to go for a loan when their poor credit score leaves them without many options. Although it may be difficult to get a loan with a bad credit score, it’s not impossible . This is where nontraditional lenders will step in and play a role in financing down-and-out borrowers. However, keep in mind that some of these loans will fall under secured loans or hard money loans, which are not based on your credit score, but require collateral. Each loan has its own pros and cons, but all can be helpful when you’re in a tight spot and you plan to use the loan responsibly. 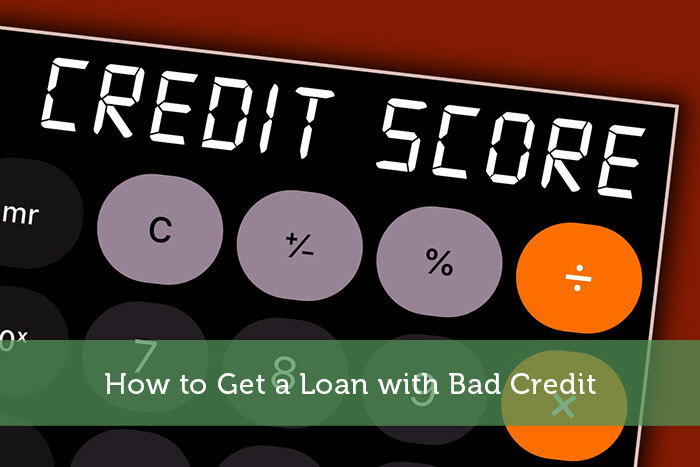 Here are some avenues to consider when you have bad credit and you’re looking for a loan. If you’re unable to secure financing because of your credit score, consider personal loans as an alternative option. Many lenders will offer this as a low-credit loan for those who do not qualify for other loans. Personal loans can be offered online and can provide quick financing for those who need emergency cash. These loans offer flexibility for the borrower and can be used in a number of ways such as consolidating debt . Personal loans are considered unsecured loans since the loan is not protected by collateral or other assets. A borrower will pay back these loans in monthly installments over the period of a short term, stretching anywhere from 2 to 5 years. Title loans are also known as car title loans or auto title loans. These secured loans give car owners a way to use their vehicles as collateral for their loan. A borrower can use the title of their car and their vehicle’s equity value to get a loan. One reason why car title loans are so popular is because applicants get approved very quickly and easily, often receiving money in hours or a few days. Those with poor credit score can apply for a car title loan and still get approved for a large loan since the loan amount is based off of the car value instead of the borrower’s credit score. These loans also offer convenience and quick access to cash for those who are dealing with an emergency situation. For example, many borrowers will use these loans to pay for medical bills or as a bridge loan for their businesses. Keep in mind each state has differing laws concerning car title loans; some states have banned car title loans, and some states have minimum loan amounts. businesses offering secure loans to borrowers. A person can use their personal belongings, such as gold jewelry, fine art, or other valuables as collateral for the loan or sell the item to the asset buyer or pawnshop. Credit checks are often irrelevant to this loan process. If a person is struggling with low credit but owns a highly valuable item, the business can offer a loan based on the item’s value. Should the borrower default on the secured loan , the business will keep the borrower’s items and sell them. However, unlike other lenders, pawnshops will not report these defaults to credit bureaus. A CD (certificate of deposit) is a financial tool that many banks and financial institutions offer as a way of having personal savings. CDs offer a fixed low-interest yield and have a fixed withdrawal date, often at a term of one, three, or five years. If you have a CD with a lender, a CD loan can be one resource to tap into. Since CD loans are secured loans, banks can offer CD loans as an option to those are unable to qualify for an unsecured loan. The loan allows you to borrow against your CD by using the savings account as collateral. Although you will have to be an early withdrawal fee and additional interest on the CD, some banks will offer this as a low-credit loan. However, one large benefit to this loan is that you can use it as a tool to improve your credit score. Another secure loan option for those who hold high-value collateral is a home equity loan. These loans allow homeowners to leverage their home’s value and borrow against their home. Home equity loans are not the same as HELOC (home equity line of credit) loans, which allow the borrower to use the home as a line of credit. Different lenders will have different interest rates and terms for these loans. Home equity loans are helpful for homeowners with bad credit because banks can still offer a loan that is based on the value of the borrower’s home. varying interest rates, terms, and conditions, P2P lenders offer more flexibility and looser requirements than banks and traditional lenders. Through this model and network, individuals with low credit scores can still obtain an unsecured loan with a lender. Even if you struggle with bad credit, you can still have hope in obtaining a loan if you seek out alternative lenders. Each lender and loan has different conditions and requirements for eligibility, but all can be helpful for those in difficult and unique circumstances. As you decide which loan is right for you, continue to repair your credit score to get the most out of your financial opportunities.